Found one file extension association related to Xilisoft Mobile Phone Manager and 1 file format developed specifically for use with Xilisoft Mobile Phone Manager. Xilisoft Mobile Phone Manager is a free PC cell phone data transfer and manager software that provides unlimited communication possibilities to manage your Windows Mobile phone on PC by synchronizing your mobile phone with PC to access mobile data. Via cable or Bluetooth, this mobile manager can also realize data backup, restoration and data transfer between computer and phone. It works well with all mobile phones with Windows Mobile OS. Moreover, this powerful mobile phone manager allows you to create your own account to protect phone data. With Xilisoft Mobile Phone Manager, you can load your contacts from phone, read messages and E-mails, edit contacts, add calendar and tasks, view notes and favorites. As phone data transfer, it can connect and communicate with more than one phone as well, no matter by Bluetooth or cable. Now, with this free mobile phone manager software, you will have a chance to enhance your PC into a mobile world. 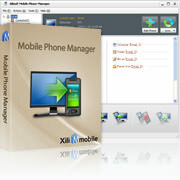 The Xilisoft Mobile Phone Manager software seems to be old or discontinued. If you need more information please contact the developers of Xilisoft Mobile Phone Manager (Xilisoft Corporation), or check out their product website.